Abstract: A veteran higher-education journalist cuts through the noise about the “crisis” in higher education and highlights the problems that really matter – and what people inside and outside of the sector are doing about it. Goldie Blumenstyk is one of the nation’s most respected higher-education journalists. As a reporter and an editor at The Chronicle of Higher Education since 1988, she has covered a wide range of topics, including distance education, the Internet boom and bust, state politics, university governance, and fund raising. She is nationally known for her expertise on for-profit higher education, college finances, and university patents and the commercialization of academic research. Blumenstyk has reported for The Chronicle from Peru, China, and several countries in Europe, and her stories have received numerous awards, including first prize from the Education Writers Association for 2011 for beat reporting on the Business of Higher Education and as a contributor to the The Chronicle‘s package,”The Gates Effect,” awarded first prize for investigative reporting in 2013. She has also written for The New York Times and USA Today, and has appeared as a guest on C-SPAN and National Public Radio. Blumenstyk’s book, American Higher Education in Crisis? What Everyone Needs to Know, (Oxford University Press, 2015) is a Washington Post best seller and has been widely acclaimed..
Before joining The Chronicle, she covered government issues and City Hall at The Orlando Sentinel. She has a B.A. (History) from Colgate University, and a master’s degree from the Columbia University Graduate School of Journalism. The value of educational experience includes: professors whose knowledge and passion about the subject guides students, class discussions help distribute insights to broaden what is learned, and education is about process not a transaction. Faculty engagement has long lasting impact. Will students actually want to “relive their educational experiences”? If not, how do we engineer these experiences. Online education has the potential to be more engaging and stimulating, and far richer than the lecture classes, and even better than the discussion section classes that go on at institutions today. Question: How much of our online education is better, and if not, what are we doing to fix that? Education technology will continue to have a bigger and bigger role. What are the economic, racial, and demographic challenges and how do we solve them? Over the past 30 years, the cost of college has increased higher than most everything else with 1.2 trillion in student debt (tripled since 2004). 40% is for graduate student debt. 70% of debt is less than $20,000. Colleges have never been more important with over 2/3 of jobs by 2020 that will require education beyond high school. An adult from a wealthy family will earn a degree / 9 times more likely by age 24 than a poor family. Since 1971 college costs have risen 3x inflation whereas income has remained flat. There have been significant cutbacks in state funding. Spending on athletics is rising higher and faster than spending on instruction. Colleges are facing pressure to spend less and show better results aka Completion, Retention, Outcomes. Disruptive innovation crowd… create a restless reform movement. Alternative education models, competency-based, MOOCs, and many of these innovations don’t involve faculty. Disruption and “Reinvention for whom” is the key question to ask. Online courses need adequate support. We are in the midst of a credential explosion. Students are beginning to desire transcripts and badges. Breaking down the diploma and establishing expanded transcripts will provide more information about an applicant. Provide more insight to the skills needed. With textbooks costs over $1,200 per year – 2/3 students say they choose not to purchase a book because of cost. OER can help reduce the cost. OER takes work to vet materials. Big data is another trend. ASU can look at the dashboard and how many students missed classes, or their advisor. Ball State has an app to help students navigate their program. How can we leverage EdTech and connect this to research on learning. What research is this based on? Are we doing the research with our tools and techniques? How can we use emerging ideas like gamification and match up student outcomes to research? You can shape the future! Self-regulated learning is key and placing the focus on the students and their ability to measure their own progress and think about what they are learning and how they are learning. Each student gets instantaneous feedback. Getting beyond virtualizing F2F into something more. Discussion board was used more by the students to help each other. Instructors were also there dedicated to their students and helping them to work through the problems and concepts. 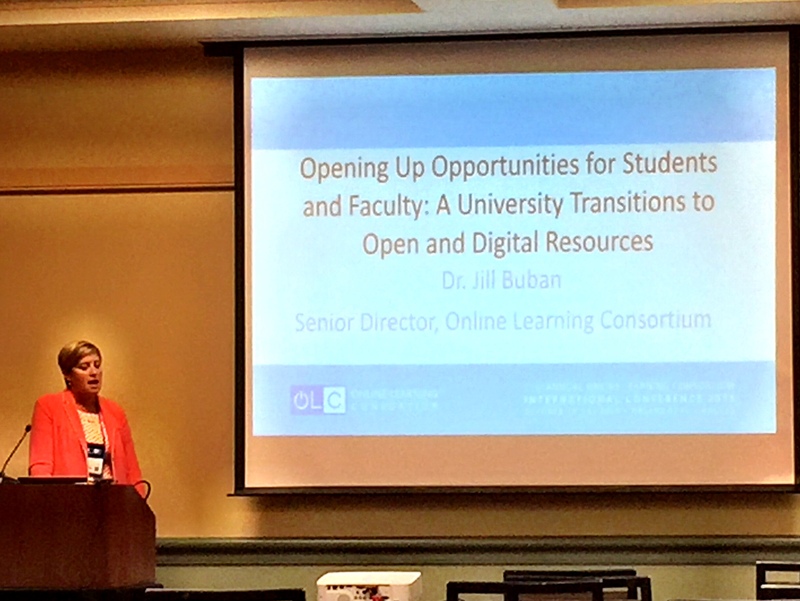 This presentation will provide an overview of one institution’s journey to transition nearly 500 courses to digital resources including open, library, and eBook resources. Background: Post University is a traditional institution (800 students) with 15,000 students taking online courses. Students were not purchasing textbooks because of cost. As of July 324 courses were using OER. Faculty perspectives around the “scholarly” resources of “open course” quality. Some faculty don’t believe in open. Does this make more work for me? What about academic freedom? 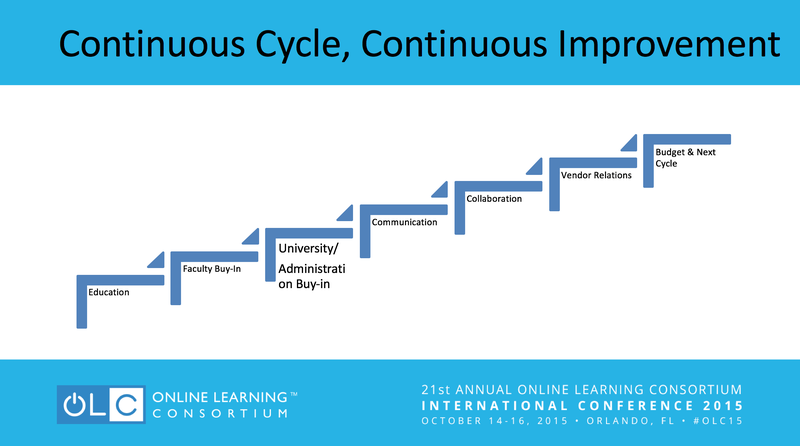 University wide systems to support: instructional design, IT, admissions, student services, student accounts, advising, library are key areas. 3rd party vendors include: bookstore, publishers, software vendors. These resources were used for open textbooks. Based in Rice University. They are entering the K12 market also. Libraries are key in gaining access to digital resources that are free or “already paid for”. Merlot is another good resource to find materials using the ISBN search. Key: Find champions and celebrate the work of early adopters. For promotion, using the LMS portal to provide awareness. When selecting resources it is important to find creative commons resources to ensure copyright clearance. It’s important to involve faculty at the beginning and also faculty governance. What do you think about open education resources? Are you using them in your course? If so, how?